Our client loved the pre-production sample of the beach towel. Thanks for helping us win the bid and producing a quality product. We rely on our vendors to make us look good and you did. I can’t thank you enough for the time and effort put into our inaugural orders for the USHW scrub program. To say you guys were under fire is an understatement. I just received the blanket sample – I’m convinced!!! 100% – #1 go to for blankets and towels. I wanted to extend a sincere thank you to you and your team for helping us get this order out the door so quickly! What started out as a simple bag order turned into a 3 drop ship, add on order that really impressed our clients with our fast turn-around given their tight schedule. Not only did you get them out the door on time, but they’re delivering 2 days earlier than required. We have our occasional bumps in the road, but things like this are what keep us coming back to you. Thank you soooo much for your awesome customer service and help with the rush order. I am sending more orders to you today and would like to send you most of these embroidery jobs. I just wanted to let your company know that you’re doing a great job. I appreciate how you care for the public needs. Keep up the fantastic work and thank you. We appreciate your hard work and handling of our job. Thank you all for caring about our client and this project as much as we do! In this industry, it’s becoming a lot more rare, which makes you guys stand out all the more. Your team put the + in customer service! Looking forward to working with your team again in the future. THANK YOU SO MUCH! The towels were received yesterday and the customers said they are “awesome”. I truly appreciate everything you did to make this happen on such short notice. The rally towels just arrived and they look great! Thanks to everyone at Pro Towels for making it happen. 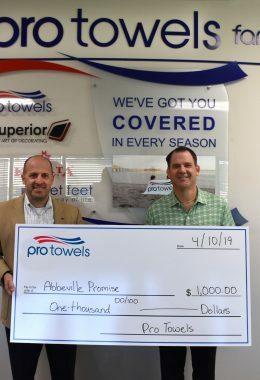 You have earned major points with our company and Pro Towels will be our first/preferred choice for towels going forward. A good story about your beach bag Pro Towels gave as an IPU gift last month. I was in Charleston, SC for the 4th weekend. We were in a boat and I had my cell phone and wallet and other items inside the bag. I was not paying any attention to it for most of the day. When I did go to retrieve something, the bag was sitting in about 4 inches of water in the back of the boat. I panicked because my cell phone was in the bag at the bottom. To my relief the bag was waterproof and my phone and wallet did not get wet. Just wanted to say thank you for your help with the Bullard order. The whole process was a breeze, which is great! And congratulations on becoming an MVPLP! Looking forward to doing more work w/ you in the future. I wanted to let you know that you are the best! For the short time we have been working together you have made the process so easy. We appreciate your efficiency, communication and knowledge. You have responded without delay which makes our job so easy. You are a pleasure to work with and I just wanted you to know you are appreciated!!!! We need more conscientious employees like Mandee who do their very best all the time! I was recently at the USAS Awards banquet where they announced the Swimmer and Diver of the year; Missy Franklin won in swimming, and David Boudia in diving. I got to meet some of the USA Diving people after the show was over and they ranted and raved about how nice the towels were that you printed and how everyone loved them. I was disappointed that we were never able to see them on TV during the Olympics, but because of limits on what they could have on deck, etc, it’s not surprising. Anyway, just wanted to thank you again for getting them done in a timely manner and for you to know how much they were appreciated. My customer received her shipment of towels today and just loves them. The experience working with you was absolutely awesome!!!!! You answered my emailed “Question Request” faster than anyone else and jumped right on the pricing and questions I had. You kept me informed and answered every email quickly and efficiently. I was on vacation and felt so at ease that you were taking care of everything. This was the best experience I have had in months!!!! It was great to visit with you last week and see everything you have and tips for selling the towels. I have pretty much sealed the deal on this 5K convincing them to switch from a tshirt to a towel. They came up with all the reasons to switch on their own after I asked them that one little question: When was the last time you threw a towel away? – Bruce Maxwell, PARAMAX, Inc.
Hello and hope all is well! I just wanted to drop you a quick line about how thankful I am to Pro Towels! The big rally towel order arrived at our warehouse, everything looks great, and interestingly enough, the towels also smell amazing! Very refreshing to stick your head in a bag of nicely scented towels! Hahaha. Thank you to you and to all your great team members. We really appreciate it. Again Pro Towels comes in #1! I my client was ordering TAP-FL and wanted extra work on the art. Larry sent two designs and the designs were so AWESOME my client doubled her order so they could have both designs. And I might add at no extra cost to my client. We have had several clients order the TAP-FL and they are all very very pleased! Thank you Pro Towels for all your AWESOME work. I just picked up the towels you produced for us last week. WOW – they are incredible! The picture on your website does not do the towel justice. You and your team are SUPER STARS! Normally I don’t even bother to vote, primarily because it’s quite a lengthy process, and in many categories they don’t list the ones I think are really outstanding! But you have gone so far above & beyond in providing excellent support & customer service to us – not to mention good products – that I had to make sure to vote for you. Hope you guys win, because you deserve it. If you guys have a testimonial section to your website, please plug in mine. Thank you for all your assistance on this order. The customer received their order and is very happy. I do appreciate Pro Towels’ level of customer service. Hello guys. I received the printed SMT Towels today and WOW they look wonderful!!! The quality of the towels are better than I expected, they are so soft. The text is sharp and the colors are bright and you can read all the tiny text in the lower logos which I was worried about. Anyway NICE JOB! I love them! I only pulled out two to look at but those were super nice. Pass it on to the printers that they did a fine job and I really appreciate everyone involved and thank you for this product. I think we may order more, I’ll let you know. Thanks again. Pro Towels really came through for me today. I forgot to order towels for my son’s 6th grade graduation banquet this Friday. I contacted them today and they will be logoed and delivered to my door on Thursday. Thank you to everyone at Pro Towels that worked on this order. You made the process painless!! It does not go unnoticed! I learned a great deal from the Webinar yesterday. You did a very good job. It was one of the best webinars I have attended. It gave me a new perspective on towels. I will be using this sales tool and others to urge customers to use more towels. Thank you for the great information! I have been in the Industry for longer than I care to think about and have been involved in a few towel projects, but have never really concentrated on this item. You made me think about all of the possibilities that I may have passed up.